Have Your Clients Outgrown Their SIMPLE IRA? Replace With a 401(k) Before November 2, 2017! | Farmer & Betts, Inc.
Have Your Clients Outgrown Their SIMPLE IRA? Replace With a 401(k) Before November 2, 2017! Have your clients outgrown their SIMPLE IRA? The deadline to replace a SIMPLE IRA with a 401(k) profit sharing plan for 2018 is November 2, 2017. 1. Higher contribution limits. The deferral contribution limit for a SIMPLE IRA is $12,500 or $15,500 for employees 50 or older. For employers that would like to increase their contributions, moving to a 401(k) plan may allow them to save more. For tax-year 2017, the 401(k) limit is $18,000 for those under age 50 and a $6000 catch up for a total of $24,000 for those 50 or over. 2. The ability to make Roth contributions. SIMPLE IRAs do not allow for Roth contributions. By establishing a 401(k), plan participants may choose to make both Traditional and Roth contributions to the same plan. 3. More flexibility in plan design. A 401(k) profit sharing plan offers increased flexibility that may result in higher retirement savings, benefiting the employer and employees alike. Additional options are available through 401(k) plans, such as automatic enrollment, loans, hardships distributions and varied vesting schedules. 4. The ability to offer other retirement plans. A 401(k) plan allows for additional retirement plans while a SIMPLE IRA requires that no other plan be offered. Converting your client's SIMPLE IRA to a 401(k) plan may address their growing needs and increase your AUM. 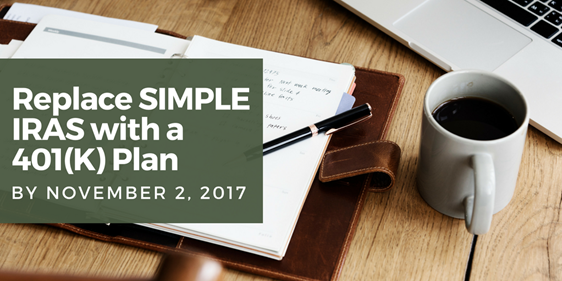 To review your SIMPLE IRA plans in advance of the November 2nd deadline, contact us today! The Farmer & Betts team offers the highest level of expertise and service, as well as an ERISA attorney on staff and an experienced compliance department. We are happy to support you with specialized plan design and competitive fees. Call or email us today to learn more. Farmer & Betts does not provide tax or legal advice. To the extent this communication mentions or discusses any tax matter, it is not intended or written to be used, and cannot be used by the recipient or any other person, for the purpose of (1) avoiding penalties under the Internal Revenue Code or (2) promoting, marketing or recommending to another party the matter addressed herein. Any taxpayer should seek advice based on the taxpayer's particular circumstances from an independent tax advisor.